Greetings! For writing this article, I was inspired by the only desire — to share my experience with people. 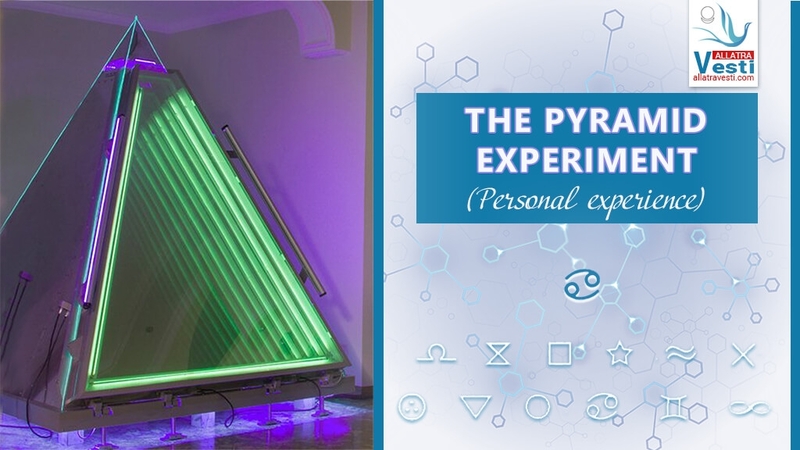 When after the PYRAMID experiment I talked to my friends, guys shared that they didn’t quite understand what they had been supposed to do. Therefore, many of them had sat down to perform spiritual practice, although the work of consciousness had been activated here. Even taking into account that the letter with symbols had clearly and precisely explained how to receive the symbol. However, consciousness never slumbers as it turned out, and it complicated everything again, and some of my friends later on thought that something was wrong with them, although in actual fact they had simply given way to lies from the system that one needed to try VERY hard in order to see it (the symbol). While actually, as it was explained, one should have calmed down and just LET the symbol reveal itself. Thus, I’ll be happy if my experience will prove useful to somebody. I’d like to note that consciousness was uneasy. Therefore, I calmed thoughts and breathing, and relaxed my body. When the experiment began, consciousness commented with fear — Oh, what will happen now? How will it be? But what I also clearly understood was that fear – it’s not me, that I just needed to pass through it, meaning, to take attention away from there and to be in the state of Love (which is a continuous state) and acceptance. I also understood that I just needed to receive the symbol. For 10 minutes after the experiment beginning there was exactly this state, plus pictures from consciousness and some fragmented thoughts. Nevertheless, I managed to preserve tranquility. Then, there was as if expansion, and the AllatRa sign appeared voluminously. And thereafter simply, without any efforts on my part, the transmitted symbol (as later on was confirmed) revealed itself. By the way, the symbol appeared rotating clockwise, which was also interesting to observe (that is, not the symbol itself was rotating, but the symbol was as if attached to a clock hand which started to move in a circle, something like that). What else can I say? That in olden times people were able to communicate at a distance, and nowadays many can do so — it’s obvious. That there is a unified information field. That all of us really influence each other and the world around on the whole, and that it is very important to feel Love and Gratitude. We should choose good, pure thoughts — learn to control our thoughts, establish our own inner “customs office” — not to admit and all the more not to spread negative news, gossips, judgements regarding other people or situations. To love is a natural state for a human being, it is inherent in all of us initially, and it’s the only thing which truly makes a Human Alive. This is true Life. But right into the house you could quietly enter. Right from here, from these patterns of behaviour in three-dimensionality, such behaviour is accordingly transferred to the Spiritual World. Therefore, in order to learn to accept, to embrace God’s Love, one needs here, in three-dimensionality, as it is said in the books by A. Novykh, and as I also understand it, to become a Human who lives by Honour and Conscience, to become Alive. For as long as there is a chance, by every moment, by your deeds, by pure thoughts, by your life, you should prove to God that you are a Human. One more important understanding needs to be mentioned — that three-dimensionality, this material world, with the animal mind system, with these patterns and pictures, thoughts and emotions, are precisely ideal conditions for the formation of an Angel, as it was explained by I.M. Danilov in the programme FROM AN ATHEIST TO HOLINESS. In order for a person to make choice. Yet, how can it be otherwise? That is, one should learn to understand, to distinguish these tricks from the system, and begin to use one’s consciousness as an instrument, so that it would start working for the Personality. So, I’ve liked the experiment. It is interesting. First and foremost, for cognition of oneself. And let me emphasize once again that this is the work of consciousness, when you as a Personality are using this tool. The most important thing is not to complicate anything. Simply calm down and just let it be, this very moment, right here and now… just Love.